Be ready for the most exiting software tool download experience you have ever seen! Open the great number software lists, control the latest updates of the widely known programs, and download programs for free. Obtain easy access to all kinds of PC apps: system tools and programs, games, education solutions, and many others. The Softempire excellent software catalogue increases always! Each new week carries exclusive innovated software applications here, the greatest software program downloads. Test now and acquire a benefit! Utility software downloads freeware, shareware, and demonstration Download now! System software to hike up your computer performance. Make the PC faster, and the very secure! Hard drive utility tools for laptop health and PC wealth. Windows XP utility software free downloads to handle files, registry, privacy, and the entire system! 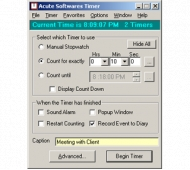 Acute Softwares Timer is a simple but highly useful program which records time elapsed in a number of ways on Win95/98/NT/2000/ME. Alarm Clock Mode (timer will count until a preset time of day). You can set alarms in either Timer or Alarm Clock mode, and each running timer can sound an alarm, pop-up a message or launch another program. You can have up to 32 separate timers running at once. In Timer mode you can set it to automatically restart, so that for example you can have a timer to remind you to do something every hour. All timers can be logged to CSV and Acute Softwares Diary, in a number of 'categories' , eg separate timers to record time spend on phone calls, admin tasks, etc. There is a Favorites list and windows management functions for when you use lots of timers at once. Exports database tables (DB, DBF, MDB, XLS, GDB, IB, HTML, UDL, DBC, TXT, CSV) to clipboard or file (text, CSV, XLS, RTF, XML, HTML, DBF, INSERT statements). Many options allow full control over output. Catalog your DVDs automatically, no typing needed. Just type the movie title or scan the DVD barcode to download all data from the Collectorz.com Movie Database. Time Control? allows you to limit Internet surfing, chatting and game playing to a time and duration you are comfortable with. Schedule the number of hours each child can use the computer, per day or week. And much more?drill down for more features. FAST Client/Server Network Technology for yourinventory, invoices and billing! Runs on all Windows Networks for Windows systems with the TCP/IP networking protocol installed. Features: unlimited invoices, quotes, payments, customers and products! Brother Drivers Update Utility updates your system drivers for Brother devices automatically with just several clicks. It will scan your system first then download and install Brother official drivers to let your Brother device work properly. Averatec Drivers Update Utility updates your system drivers for Averatec Laptops automatically with just several clicks. It will scan your system first then download and install Averatec official drivers to let your Averatec Laptop work properly.